Being the first battalion of the regiment this battalion gets one white regimental standard and one coloured battalion standard. The third battalion will receive two coloured battalion standards whenever it is formed. For the record the figures are all from Front Rank Figurines and were painted by the Greater Queeg. Standards from GMB Designs and composition, basing etc by von Peter himself. Last Sunday von Peter himself and The son & heir ventured back to the French & Indian Wars in North America care of a time machine provided by Raymond Hutchison. 28mm black powder skirmish was the order of the day using the card driven ‘Muskets & Tomahawks’ rules from Studiotomahawk. 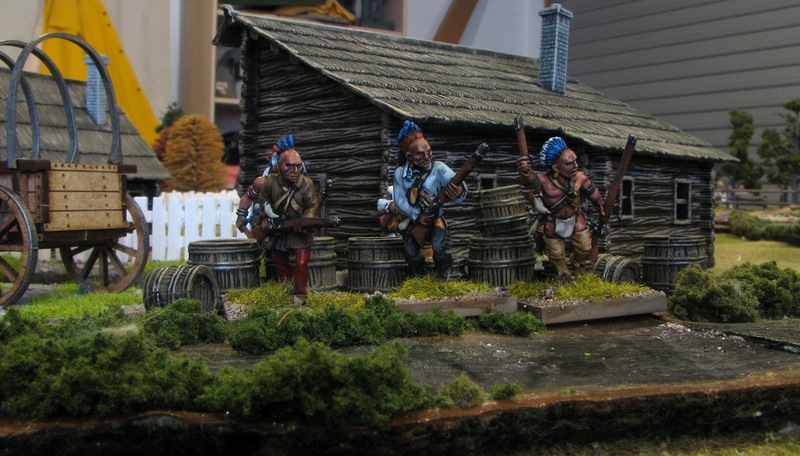 This is the same French company that produce the Dark Ages skirmish rules ‘Saga’. 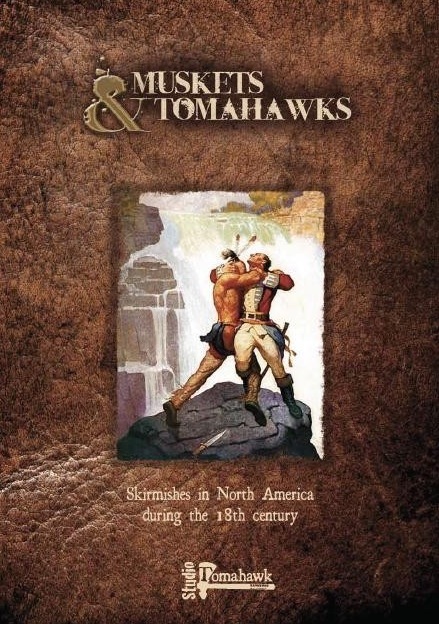 Apparently ‘Muskets & Tomahawks’ predates ‘Saga’ but ‘Saga’ was the first of the two to be published in English. If you’re interested you can check out Studiotomahawk’s forum. von Peter himself was allocated the French allied Indians – the Hurons – while The son & heir was in charge of the partly regular, partly irregular French Marines. Michael had the French regulars but spent most of the game making his way through the woods. Craig & Colin ran the British who had the primary task of protecting a village and it’s citizenry that was placed roughly halfway between the two forces. Their task was always going to be of the uphill variety. Officially the French were not into wanton slaughter of civilians but what did the pale faces know. The Hurons had been promised plunder and the campaign to date had been noticeable for its lack of plunder. And there was bound to be plunder in the buildings! In short the Hurons successfully plundered the village taking a few scalps along the way. Craig made them pay though with two of the three warbands gutted. In reality this would have been serious losses but was not a gaming consideration. Raymond supplied the figures and terrain … and von Peter himself hardly took any pictures at all being fully occupied scalping civilians and militia. D’oh. The picture above of the three Indians gives an idea of the quality of the figures used in the game. There were actually six Indians present but the photos showing all six game out blurry while these good ones managed to hide the three rearward figures behind the front ones. Double D’oh! As can be seen Ray should be justifiably proud of the game he put on. And don’t forget to click on the images for a larger more refined version.